Golden dome was used by the Nazis in WWII as a reference point of what they bombed in St Petersburg. 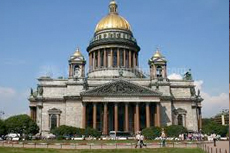 Golden dome was used by the Nazis in WWII as a reference point of what they bombed in St Petersburg. It was left standing and still bears the scars of those bombings. Incredible art survived the war and paintings are beautiful. Not as impressive as the Church of the Spilled Blood, but still a beautiful church! Excellent and very informative and well organised tour. Excellent and very informative and well organised tour. Knowledgeable tour guide. Very nice tour. Beautiful Cathedral. The model of how they build it was pretty interesting. Amazing architectural building currently used as a museum. This tour took us to Church of our Savior on Spilled Blood and St. This tour took us to Church of our Savior on Spilled Blood and St. Isaac&apos;s Catherdral. We were able to go into both. Lovely exterior. Smaller inside than Spilt Blood but very nice. Just stood with my mouth open. Just stood with my mouth open. It was so beautiful. Beautiful cathedral. Ther was a video and display showing how they were able to place the columns in the front. Another beautiful church. Amazing architecture. An awe inspring cathedral with much history. Spectacular. Had plenty of time to explore and photograph. One of the highlights of this city. This is one of the largest cathedrals in Europe. No time to enter and it is undergoing restoration so the exterior views include scaffolding.